This marks the fifth year for what has become one of the most highly regarded events on the west coast summer music festival circuit. 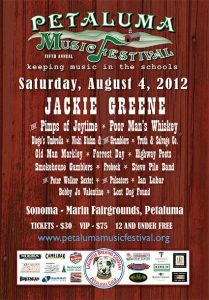 The Petaluma Music Festival takes place on Saturday, August 4th, 2012, at the Sonoma-Marin Fairgrounds & Event Center in Petaluma. With past festival performances by national acts like Trombone Shorty, The Devil Makes Three, ALO and The Mother Hips, festival goers are always treated to a family-friendly event with a unique variety of indie-band music for people of all ages. This year is no exception. Performing at the 2012 Petaluma Music Festival are roots-rock bluesman Jackie Greene, the funk and groove of The Pimps of Joytime, the high-octane hootenanny of Poor Man’s Whiskey, rocking country soul singer Nicki Bluhm & the Gramblers, the ambassadors of San Francisco gypsy rock Diego’s Umbrella, psychedelic southern rock quintet Truth & Salvage Co., and the punk tinged bluegrass of Old Man Markley. Joining these national headliners are Bay Area favorites Forrest Day, Highway Poets, Smokehouse Gamblers, The Pulsators, Lost Dog Found, Steve Pile Band, Bobby Jo Valentine, Frobeck, The Peter Welker Sextet, and Ian Lubar. Rounding out the day are the Wine & Food Tasting Pavilion presented by Whole Foods (24 of Sonoma County’s best wineries and food purveyors), a silent auction, a celebrity autographed guitar raffle, a Kids Area, free Camelbak water bottles and drinking water, and a variety of specialty food, craft, and merchandise vendors. The presenting community partner is the Lagunitas Brewing Company.